The most awaited phone of the year, the Samsung GALAXY S4 launched a couple of days ago in India. Needless to say, it has intensified competition in the top-end Android segment. So if you're looking for a top-of-the-line smartphone, your options are no longer restricted to the Sony Xperia Z and HTC One. Pricewise, there's not too much separating the three. If you are planning to pick up one, here's a quick look at how these handsets pit against each other on the basis of specs and features. 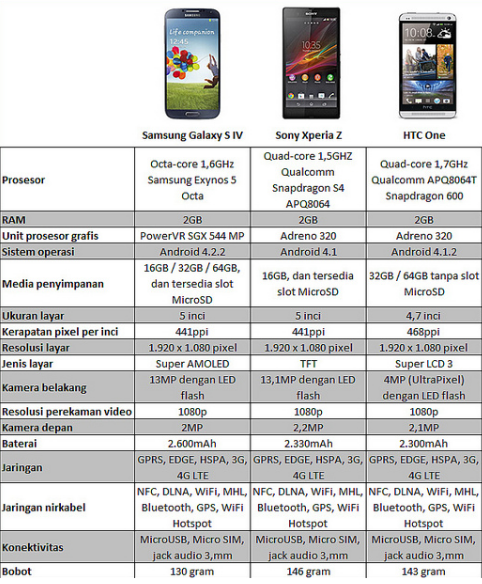 The GALAXY S4 and Xperia Z sport a 5" screen as compared to HTC One's 4.7-incher. But the similarity between them ends right there. The S4's Super AMOLED full-HD screen is very impressive. It produces excellent blacks and contrast. On the other hand, despite touting the Mobile BRAVIA Engine 2 tech, the Xperia Z's screen doesn't really impress when it comes to the contrast and colour reproduction. The HTC One comes with a 4.7" Super LCD3 capacitive touchscreen. It produces natural colours and good contrast. Thanks to the 1080x1920 pixels, the screen looks very sharp. And it is protected by Gorilla Glass 2. 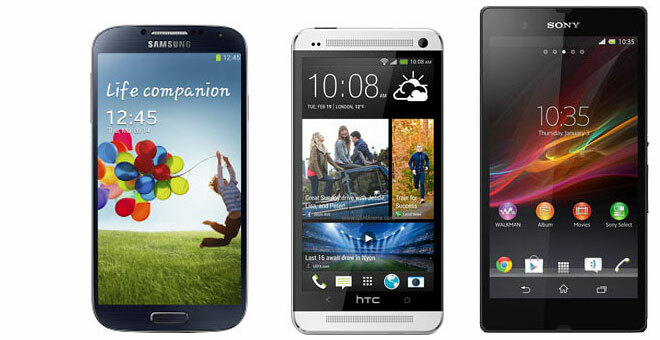 So in terms of display, the S4 wins and the HTC One comes second. 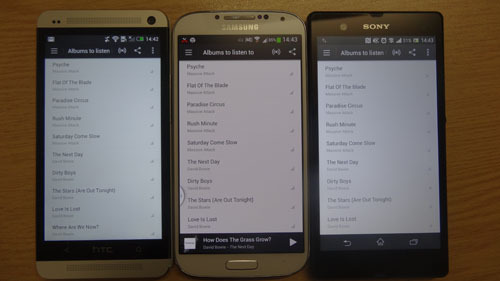 Speaking of design, the Xperia Z and HTC One are way better than Samsung's latest handset. The HTC One ups its game with stunning aluminium body. I'd go on to say that it's currently the only Android phone that can compete with iPhone in the design department. The Xperia Z too is nothing short of impressive. It sports a nice and clean design that's easy on eyes. Moreover, it's a rugged handset with IP57 certification, which means it can withstand dust and water. On the other hand, the S4 sports Samsung's own done-to-death design for a flagship phone. After spending more than Rs 40,000, I don't expect my phone to look like a mid-range GALAXY Grand. 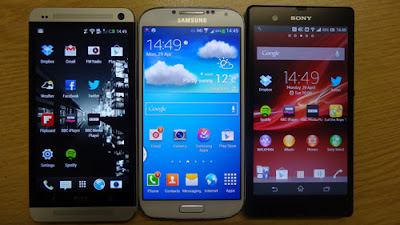 So if you care about the aesthetics, you're better off with the HTC One or Xperia Z. The Xperia Z is powered by a quad-core Snapdragon S4 chipset clocked at 1.5 GHz, and there's 2 GB of RAM. The HTC One boasts of a 1.7 GHz quad-core Snapdragon 600 chipset coupled with 2 GB of RAM. In both the phones, gaming is taken care of by the Adreno 320 GPU. In comparison, the S4's Octo-core Exynos 5 sounds even more interesting. Going by the benchmarks, the S4 has already established itself as the fastest Android device in the market. Having said that, each of the 3 handsets have ample firepower at their disposal. In India, both the Xperia Z and S4 come with 16 GB of internal storage. Using the microSD card slot, you can add another 64 GB to it. The HTC One offers 32\64 GB of storage, which is not expandable. With sheer number of features taken into consideration, the S4 is unbeatable. Seriously, none of the Xperia Z and HTC One can match this list of features — Group Play, Story Album, S Translator, Optical Reader, Smart Scroll, Smart Pause, Air Gesture, Air View, S Voice Drive, Samsung Adapt Display, Samsung Adapt Sound, Auto adjust touch sensitivity (Glove friendly), IR port, Safety Assistance, and Screen Mirroring. Frankly speaking though, many of them are nothing more than a gimmick. But if sturdiness tops your requirement list, then the HTC One or Xperia Z would serve you a lot better than the S4. Backed by a powerful processor, all three handsets sport some really quick cameras. Samsung's 13 megapixel snapper offers plenty of features such as Dual Camera, Drama Shot, Sound and Shot, and Eraser. Similarly, the HTC One packs in an interesting camera mode called Zoe. The Xperia Z's 13 mp camera, on the other hand, banks heavily on the low-light photography. 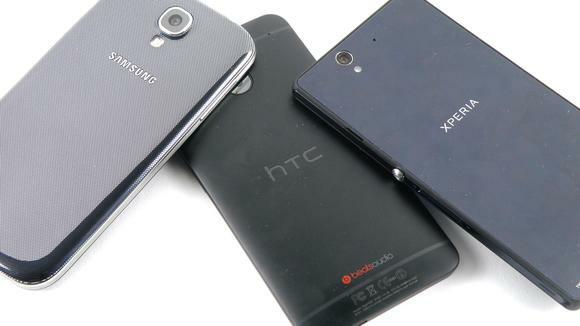 The weakest link here is of course the HTC's 4 "ultrapixel" camera that loses out on details. Since we haven't tested the battery life of the S4 and Xperia Z, I would refrain from commenting on their battery performance as of now. Going by the numbers though, HTC One's 2300 mAh battery is only 30 mAh less than what the Xperia Z offers. Once again, the S4 takes the top spot here with a bigger 2600 mAh pack. But at the end of the day, it is not just the capacity of a battery that dictates the eventual battery life of a phone but how efficiently the power at your disposal is used. If you are looking for a more durable phone or a refreshing phone design, the HTC One and Sony Xperia Z fit the bill. The Xperia Z's strength lies in its IP55 and IP57 ratings, which indicate the highest levels of dust and water resistance. Simple but classy design is yet another understated hallmark of the Xperia Z. On the other hand, the full metal body of the HTC One offers a unique looking rugged build, while its curved back makes it comfortable to grasp. Should you want to consider your next flagship device based on the best user interface, look no further than the HTC One smartphone and its HTC Sense 5 user interface with the HTC BlinkFeed. Simple, elegant and straightforward summarizes the UI. Further to that, it offers an interesting photo and video shooting interface with the HTC Zoe function. On a side note, the HTC One has the best speakers on any smartphone to complement its multimedia experience. If you are looking at an Android smartphone which delivers great all-round performance, we highly recommend the Samsung GALAXY S4. Just look at the sheer number of software features, great battery life, superb imaging performance and smooth operation on the GALAXY S4, and you will know the rationale of our recommendation. Existing GALAXY S III and Note II users would likely have a hard time deciding if upgrading to the GALAXY S4 would be worthwhile, but unfortunately, there's not a whole lot to be gained. All three phones look very similar, while any differences boil down to the internal hardware and software features available. Taking reference from Samsung's track record of software upgrades, it is likely that some (but not all) of the new software features will be available to existing GALAXY S III and Note II devices. *The Motorola X will feature the current development on a 1080p Full HD screen display but it is not identified if it will be an LCD or OLED. Though Motorola's Razr line has been using Super AMOLED, the LCD display incorporation may happen since Motorola X is in progress with input from Google that has utilized LCDs in its Nexus devices. Article by Faiz Marjan, Source from Tech Blog .